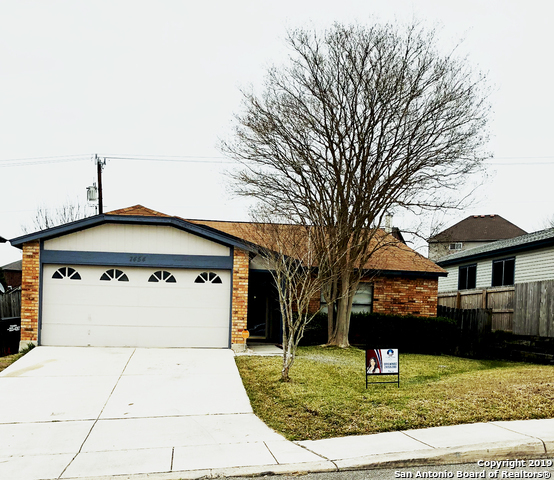 All Ventura homes currently listed for sale in San Antonio as of 04/24/2019 are shown below. You can change the search criteria at any time by pressing the 'Change Search' button below. "Gorgeous 4-bedroom 2.5 bath 2-STORY home located in Ventura Subdivision! Located on a quiet Cul-de-Sac with minimal traffic. Stunning upgraded kitchen with stainless steel appliances! Oversize Master Bedroom with king-size closet. One of the largest homes in community! 2-sets of French doors leading to 2-patios! Large storage shed/work shop. Home Chandelier and concrete bench outside do not convey. Lift chair will be removed." "Landlord needs to sell fast, but does not want to disturb tenant so they are offering $8000 allowance with full price offer to be used as buyer wants - replace carpet, other upgrades or toward closing cost. Home has open-space layout, a huge kitchen with Island, four large bedrooms and great storage. Master bedroom is over-sized with a large closet ready to fit all of your stuff. Backyard is perfect for BBQs and just the right amount of yard to take care of. Home is ready for YOU!"